If you have high expectations for your child’s future, we would like to be a partner with you in your child’s treatment process. Is ABA a good fit for my child? We have found that ABA can be of benefit to ALL children in reaching their individual potential. We have also found that the extent of benefit depends on the following factors: the quality of the Service Provider including qualifications and extensive experience; the personal and social resources available to the parents, including how whole-heartedly they embrace ABA philosophy and practices, as well as how available they are to participate meaningfully in their child’s program; and the extent of the child’s own skills and challenges. Perhaps the most important factor is the successful interaction of all of these components, resulting in a cohesive team working towards the same goal: your child’s growth and learning. 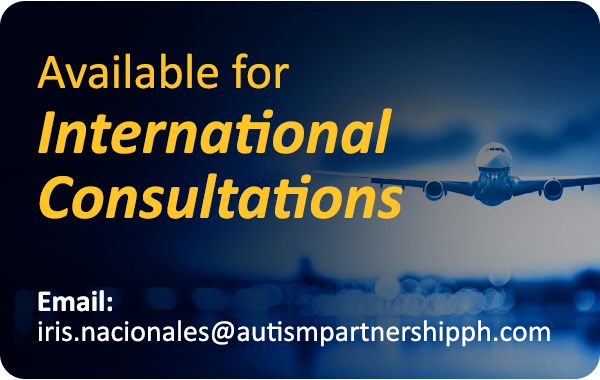 Will Autism Partnership travel to my area of the world? For families that reside outside of Seoul, Autism Partnership Consultants travel and provide services to children worldwide. Families, school districts, and agencies are encouraged to contact us directly for Consultant availability. What is the best age to start an ABA program? The sooner you begin intervention the better. Don’t wait! Research into the effectiveness of intervention with students demonstrates better outcome with early intervention. But, it’s never too late to start. The strategies of Applied Behavior Analysis (ABA) can help individuals of all ages. A key to ABA success is to immerse the child into treatment for as much of the day as possible. We don’t want to lose valuable time. Young children are able to not only tolerate intensive intervention but thrive on the stimulation. It is important to use as many opportunities throughout the day to teach appropriate skills and to reduce the child’s opportunity to engage in detrimental behaviors. Working regularly with children as young as 20 months, Autism Partnership staff have unequaled expertise in providing treatment sessions that are age-appropriate, energetic, playful and full of reinforcing activities, while respecting the natural stamina of the child. When intervention is creative, natural and fun children are eager participants. Fatigue and ability to engage are closely monitored and the number of weekly intervention hours are adjusted accordingly. How many hours of treatment should my child receive? Our goal is to achieve the best possible outcome for your child. Since research and our clinical experience confirm that children who receive more hours of quality behavioral intervention make better progress, it is common for many children served by Autism Partnership to receive between 20 and 45 hours per week when services begin. Mastery of skills, reduction of interfering behaviors, increased attendance in school and/or more involvement with friends and community activities may result in a recommendation for a reduction of time spent with Autism Partnership staff. It’s a common misconception that ABA doesn’t apply to children who are at a higher functioning level. ABA is designed to provide a varying level of structure according to the need of the student. High functioning children are better able to learn in a less structured format and the program is adjusted accordingly. In fact, ABA strategies are incredibly effective and important for this population. As a parent, will I be involved in my child’s treatment? Parent involvement and ability to implement Applied Behavior Analysis strategies are essential for obtaining the best long-term outcome for a child. Therefore, we are committed to our partnership with parents. 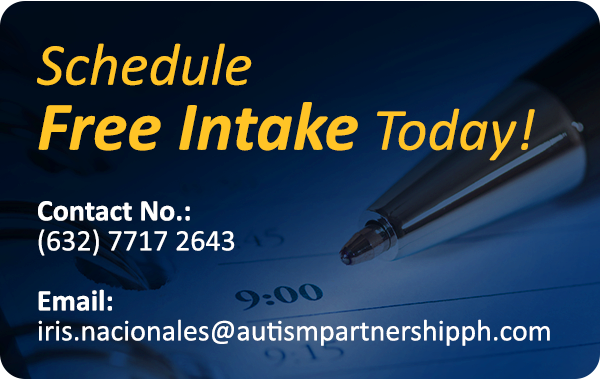 Once receiving services from Autism Partnership, Program Supervisors will invite you to training workshops and seminars, and will schedule individual parent training sessions on a regular basis. To improve skills, parents participate in some of the weekly ABA sessions with our staff and attend monthly clinic meetings with their child’s Case Supervisors. We recognize this as a tremendous commitment of time and energy, but we know it is critical to the success of the child’s program and both the child’s and the family’s quality of life. All of the work that the AP team does with a child is greatly amplified by the involvement and expertise of parents. As a parent, I’m concerned I’ll have too much to do. Any advice? Research indicates children make the most significant progress in the first two or three years of intervention. While the initial learning curve is steep, many parents adopt a mind-set that the extra time and effort spent now will reduce stress in a very short time and result in the children requiring less intensive intervention in the future. Many of our parents have been successful in committing to the process by building a solid support system. By having family members and friends help with babysitting other children, commuting to our clinic or cooking dinner once in a while, parents have been able to maintain focus (and sanity). Although we know this is difficult, some families have found it is worthwhile for one of the parents to reduce their work hours. That’s a difficult question to answer. The vast majority of our families require services for two to four years. Prepare yourself to give 100% during that time. Some students stay longer, but with a reduced model of service (e.g., school support, case consultation, etc.). If you’re going to embark on an ABA program, you should prepare for a long, but incredibly rewarding journey.